Hello all! When I see a great stamp set I always get the urge to create as many cards using it as I possibly can. I brainstorm ideas, I browse Pinterest and finally I sit down and create. 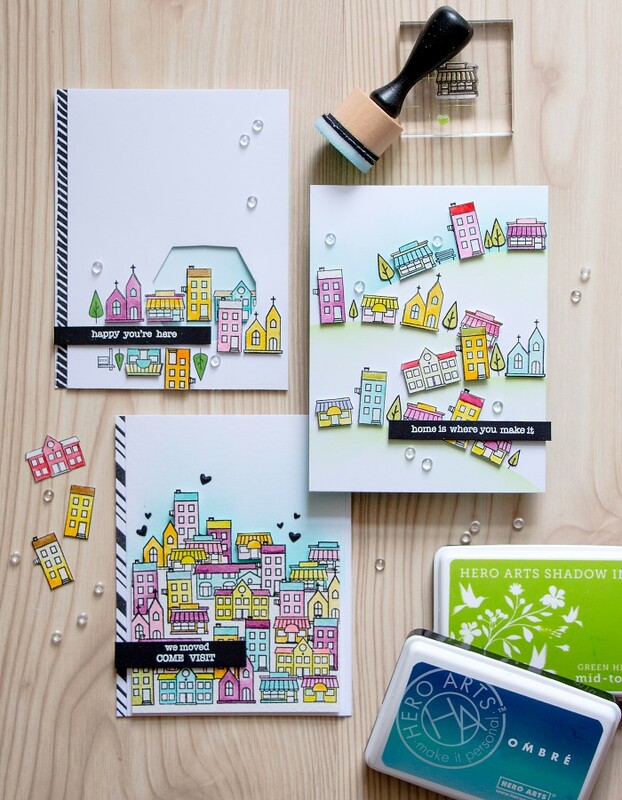 Hero Arts Town Essentials is one of those sets. 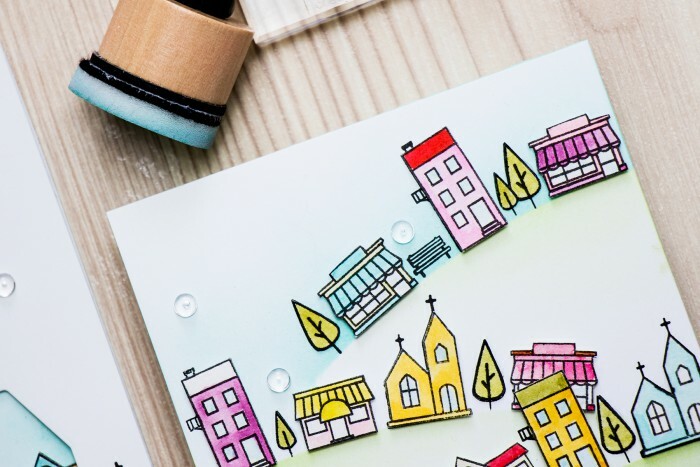 I love the itty-bitty houses, little cars, trees, even the bench and fountain – these are so darn cute! 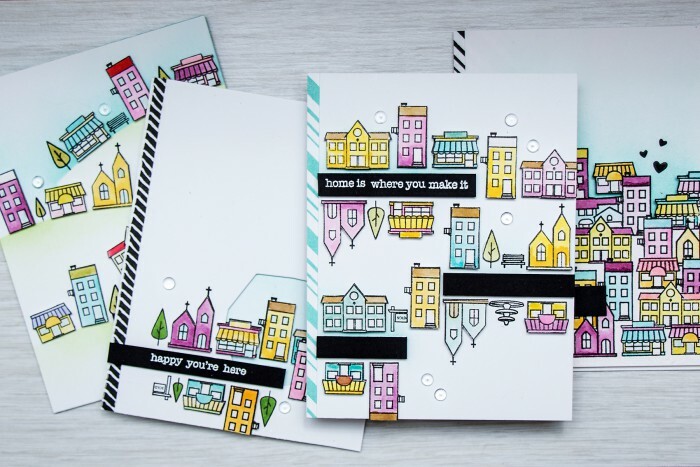 I wasn’t sure what I wanted to do with these at first, I stamped a couple houses in a row and watercolored them, but didn’t quite like the result and than I got the idea to cut the individual houses apart and create little scenes on my cards. The first one I made was the one with hills “Home Is Where You Make It”. It was probably the easiest one to make. I made a few masks out of printer paper – just drew a couple hills with a pencil and cut them out and inked the front of the card base using Green Hills ink for the hills and Pool ink (I used the lightest color from the Pool to Navy ombre pad) for the sky. The sentiment, Home Is Where You Make It, was slightly altered – I cut it apart (it was a 3-line one) and turned into a single line sentiment. I did that for all 3 cards I’m sharing today and all of them were heat embossed in white over black card stock. Once the ink blending on the base of the card was done I started adding my houses one by one. 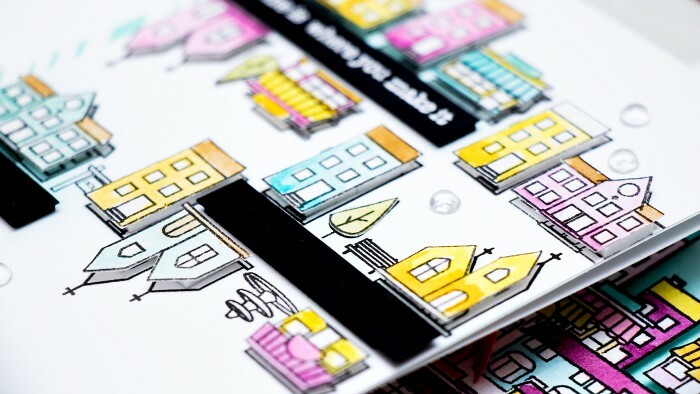 I did stamp corresponding images on the card base and than foam mounted the individual colored houses on top. This was especially helpful with the tall house with the balcony and chimney as I didn’t cut those out and also with the church – it would have been too difficult to cut the crosses out. I didn’t color the bench as it was just too small and I didn’t want to mess it up, but I did watercolor trees (and adhered the tree tops on the card). I also added a couple clear drops as little accents. My next project, We Moved, Come Visit, was created using lots and lots of masking. We have a bedding set with a similar design – a bunch of houses in front of other houses, in front of more houses filling full sheet. so I thought I’d create something similar here. I didn’t do the entire card front, but I did mask and stamp a lot. These were also watercolored. I cut out the entire panel this time and foam mounted in onto a white panel with some blue ink blended in the top part to look like sky. I also stamped the Candy Stripe in black ink onto the card base to add some interest to this card and die cut several hearts out of black cardstock using the Sun Showers dies. I could have stamped the hearts and it would have been easier, but I wanted the die cut them. My third project, Happy You’re Here, is actually a window card of some sort. There isn’t a window that goes all the way through the card base, but there is an opening in the front panel done using the Terrarium die (I really wanted to find something out of the box). The space in the opening was blended using Pool ink to make it look like sky. The strip to the left was stamped in black using Irregular Arrow background stamp. A few houses were adhered upside down, I wanted to make the sentiment strip look like a road and thus had the houses at the bottom adhered that way, I really like this trick (an that sparked an idea for another card). The trees were stamped directly onto the front panel and colored using a single green Copic marker. I had a blast making these cards! I filmed a video tutorial, you can watch it at the top of this post or on my Youtube channel. If you like it, I would appreciate you giving it a thumbs up and sharing. Thank you! HI ! 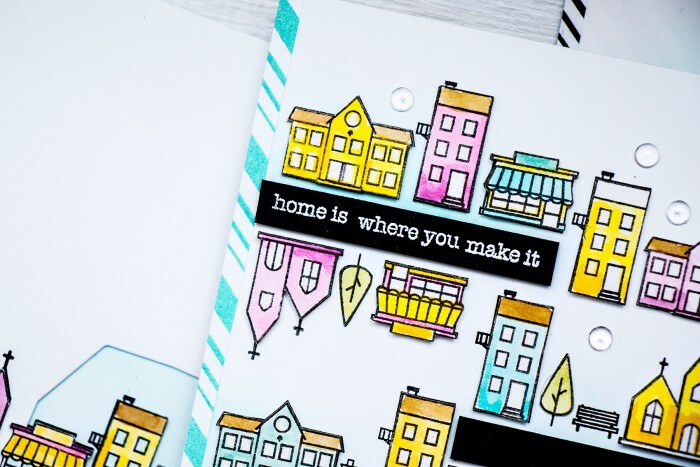 I LOVE stamp sets with houses in them, too. I need to buy this set, too. I like your warm color tone and your creative ways to use the stamps. Very sweet cards! Thanks for sharing. WOW Yana, what wonderful cards. What a tremendous amount of work??? So worth the time. They are simply amazing! 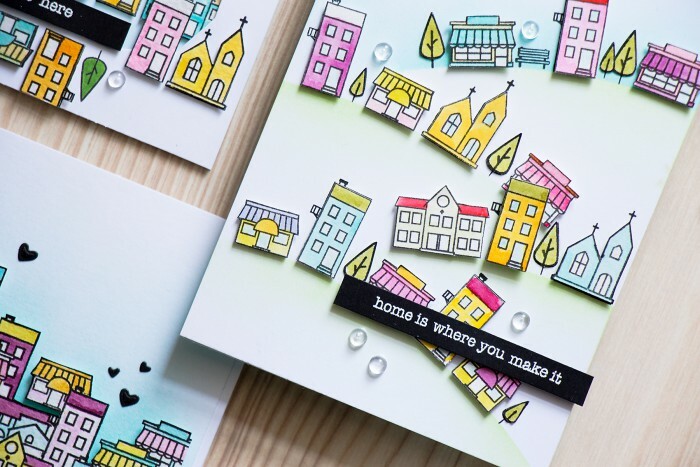 Yana, your cards are so super adorable and this set is perfect since we’re building a house and I’ll be sending out lots of change of address cards. I see a lot, A LOT of work that was done to create these cards. So pretty and playful! Absolutely love the idea! 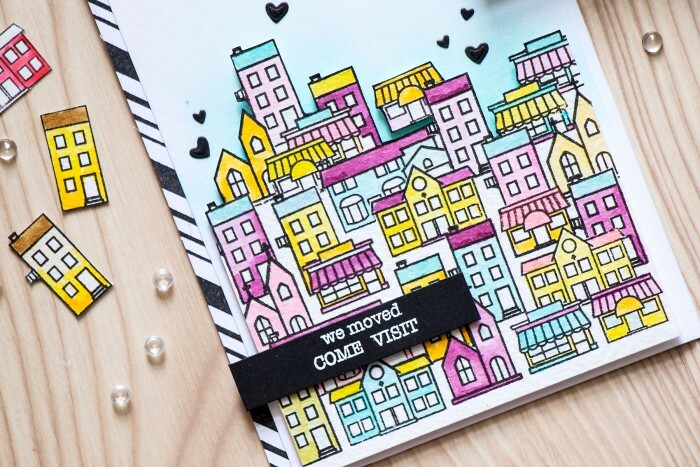 Especially where houses are scattered around the card. Thank you for the video too, showing your process! Would you please share the brand name of the paper you use? I might be able to find it locally in Europe? Wonderful cards Yana….you are right, they bring a big smile!! !